It has to be said that our fair music scene is in very rude health at the moment, as demonstrated by the reviews that I choked up last weekend. 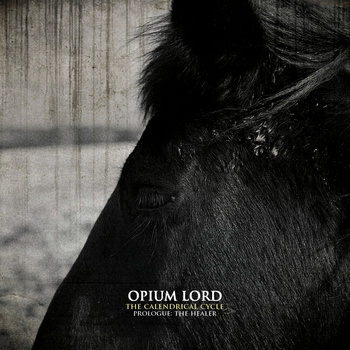 Opium Lord's new EP was meant to be my fifth review of that weekend, but it never came to be. It's only fair then that it should be my next one, so here it is. Opium Lord has risen from the ashes of previous notable acts like History of A Hawk and has caught the attention of Thirty Days Of Night Records, whom are releasing their debut EP The Calendrical Cycle - Prologue: The Healer. They've also made enough waves in their short time together, to justify a support slot alongside the might Boris, so whichever way you look at things, it's all coming up Millhouse for these guys. This EP is the first part of a concept series which will also encompass their next two albums and is due for release on March the 11th. This EP spans two tracks of dark, oppressive sludge inspired metal. Opener Heroin Swirls whirrs into life with slow as hell riffs and crazed screams. The drums pound a measured beat that holds it all in place. There are moments of silence, of near as damn it, which build images of drug-addled trips and near death experiences. It's crushingly heavy, heady stuff and when the feedback rings out in the middle, it becomes even more maddening. That feedback delivers you to second track Street Labs in a close-to catatonic state. The jabs of melody that appear in this song slowly bring you round, but don't completely wake you from the nightmare. The almost black metal growls that manifest themselves into the song will have you praying for death. That melodic guitar I was talking about before is some of the strangest I've heard, thanks to the way in which it's played. It does however completely fit this unholy racket. A lot happens across these two tracks and the EP acts as a taster for what's to come from the two full-lengths that Opium Lord has promised. I can't wait for them, if this is anything to go by! The EP is up for pre-order now as well at the Thirty Days Of Night store here - tthirtydaysofnightrecords.bigcartel.com. Opium Lord can be found here http://www.facebook.com/opiumlord.